Wow! How cool is that to have my first two covers on the store shelves at the same time! You can see the whole quilt here until you get your hands on the magazine. 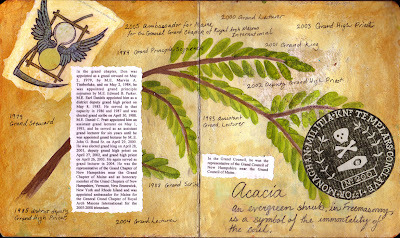 Or you can see it for real at the International Quilt Festival- Chicago next weekend in the Cloth Paper Scissors exhibit "True Colors" of mixed media paper quilts. These are all set to have the pewter metal stitched to them. Today was my dads birthday, he died just after midnight a year ago today. I wish that I could have shared with him my accomplishments this last year. I know in my heart he knows, but I still would have liked to see his face and hear him say "ay yup" with his strong Maine accent and his pipe in the corner of his mouth. 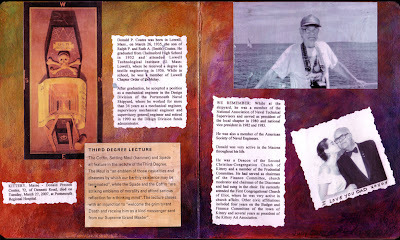 I made this book after he died. My dad had the longest obituary I think I have ever seen, full of all his accomplishments as a Mason. 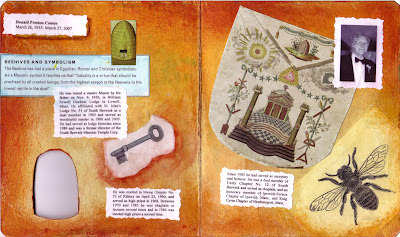 I cut up his obituary and collaged it into the book and painted Masonic symbols to go along with it. 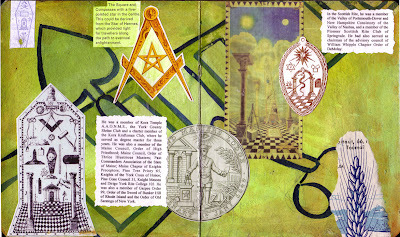 He came from a long line of Masons. Growing up I never really understood what he used to do at all those meetings. 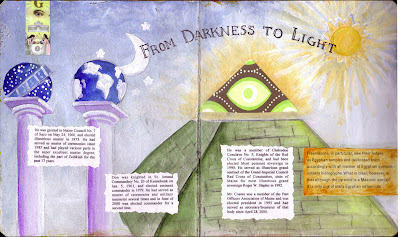 Over the years I asked my dad about the Masons and found it to be a really interesting organization full of symbolism, ritual and mystery. It was his path to living a good life with moral integrity. The Masonic organization was the most important thing in my dads life, it defined who he was, and I think it made him a great man. I love seeing where people make their art, what inspires them and gets their creative juices flowing. 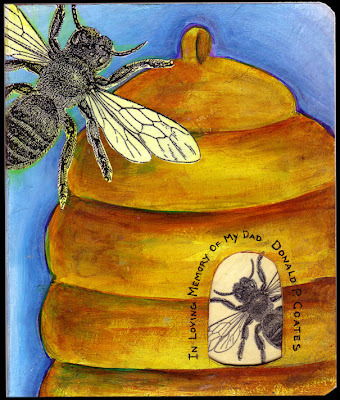 Well evidently Pokey does too, she created this incredible special issue. 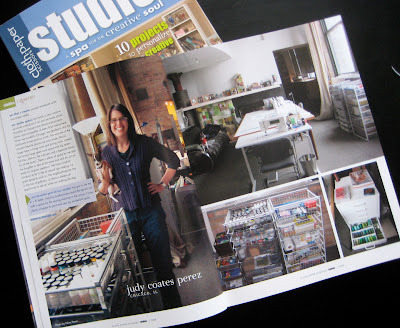 You are going to love this, there are studio vignettes (little sneak peeks into CPS and QA artists studios), and a section featuring some fantastic studios that are the ultimate in art making environments. Pokey has a to-die-for studio make over and then there are some fun projects to personalize your studio. Boy, was I surprised to see myself on the table of contents page, but just look at all the artists and good stuff included in this issue. Click on the page to read it. 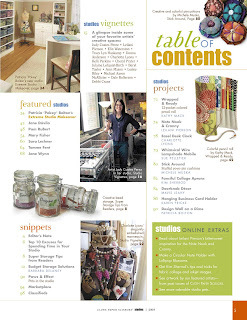 I admire Jane Davila’s custom designed studio with furniture she built herself. I can't believe how perfectly stacked her fabric shelves are, come on Jane how long does it really look like that? lol. Mary Fisher has the ultimate dye space, that sink, I am so envious, and wow what a studio! Jane Wynn’s space is filled floor to ceiling with bins and drawers that you know are filled with the coolest (and creepiest?) stuff on the planet. Sara Lechner wins the award for the studio with the most artistic charm, a European white washed hayloft. Oh, I swoon. 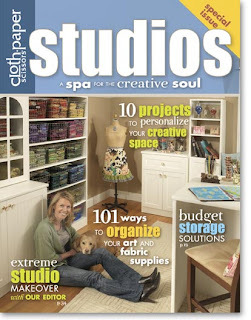 There are so many wonderful studios in here with great ideas for organizing, I could go on and on. You have to run out and pick up a copy, it is supposed to hit store shelves April 1st, but I have noticed many stores put them out earlier. Here I am in my studio, it’s a rare thing to see my table this clear. At least I have it documented to prove that it was this clean once. 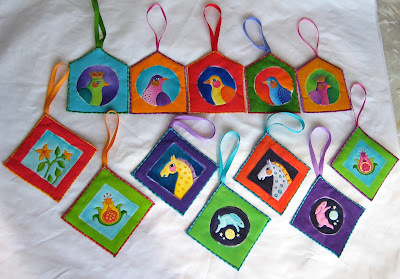 I am working on a new batch of Fiesta Ornaments for Open Studios. I will demonstrate painting fabric on a couple ornament designs on Friday afternoon (2:30-4:30) and I will be sewing and embossing metal to finish the ornaments on Saturday (2:30-4:30). The painting takes a long time (especially when talking to people). 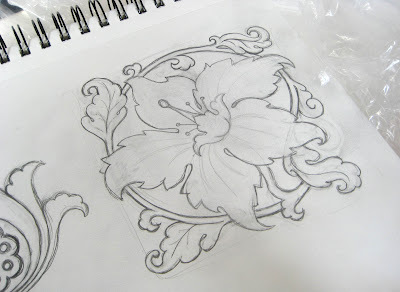 The sewing and embossing is much faster, so I want to have plenty of ornaments ready to do the final metal work. These ones are ready for quilting, trimming and edge stitching. 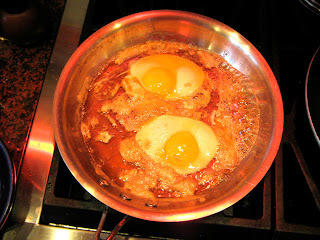 When I was a little girl in Massachusetts, we used to go to my grandmother's house in Lowell for Easter and we always had eggs poached in pure maple syrup. My grandmother was French Canadian so maybe that is where it comes from. As strange as many people think it sounds, it sure is good. If anyone else knows of this tradition please comment I would love to know where it originates. 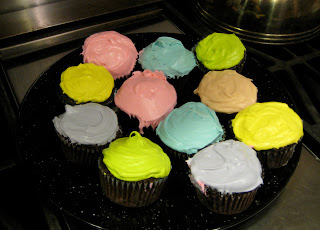 Since my kids are now teenagers we decided to forgo the chocolate bunnies and jelly beans this year and make chocolate zucchini cupcakes. This cake is my families favorite, it is so moist and chocolaty with a hint of cinnamon. If you would like to try this cake you can find the recipe here. I am sure you will not be disappointed. 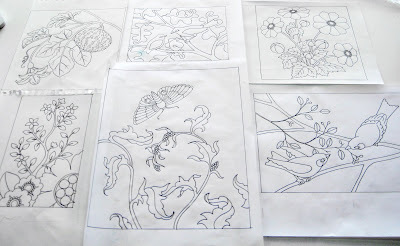 This week I have been working on designs that could be used for fabric painting workshops. 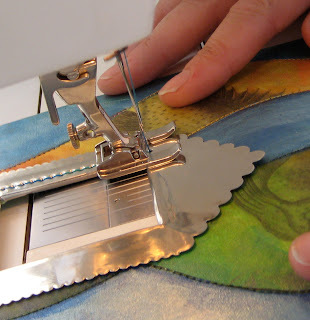 I gave my daughter Nina a short lesson on free-motion quilting yesterday. I gave her a quick demo (about 2 minutes) explaining about coordinating the speed of the foot pedal while moving the fabric. I asked her to write her name and follow a wiggly line and then start seeing what she could do with the stitching. Before long she was drawing bones, veins, a tree, a squid, a heart, an eye and skull. 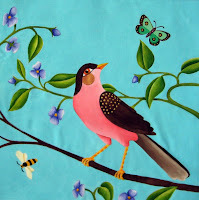 She is not really interested in making quilts, but she really likes sewing and making things. 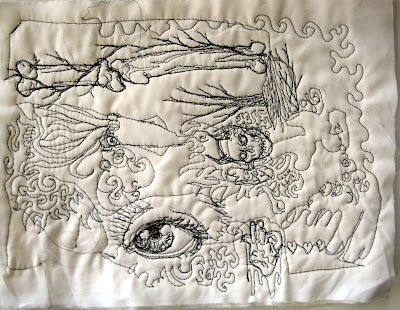 I did not tell her any of the “rules” about quilting, just let her play and see if she could control the needle and draw. For her first time free-motion stitching I am pretty impressed. 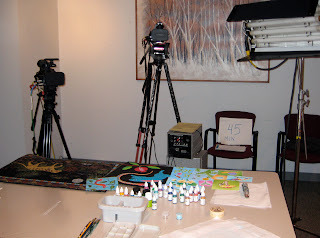 While I was in Ohio taping the episode for Quilting Arts TV I filmed two classes for the festival. These will not be like your typical online classes with photos and pdf files to print out, they will be like watching an hour long instructional video on your computer. From what I understand you sign up for class and can watch it as many times as you want for a couple months. You will also have an opportunity to chat with the teachers the week of the festival. This was my view while filming except there were two guys manning the cameras; one for a wide shot and another for close up. Helen from Quilting Arts sat in the chair and held up signs to let me know how much time had passed. We had to stop a few times for technical things but otherwise the workshop was filmed straight through. It is funny how things that never seem to happen in normal life, like flinging a bottle of paint through the air, seem to happen while you are being filmed. 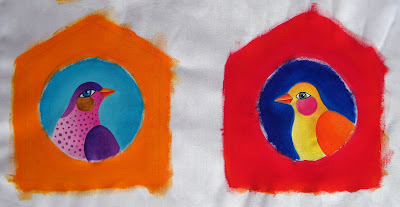 My second class is mixed media painted fabric. 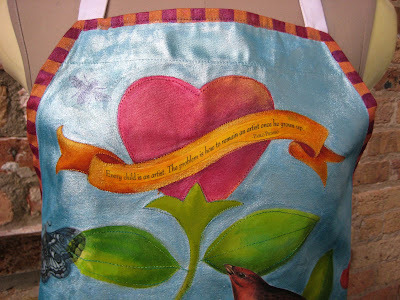 It is a demonstration of the painting technique I used to paint the fabric for the bird houses in Cloth Paper Scissors and this tote bag. Be sure to go over to the festival web page and put your name on the list to have information emailed to you for pre-registration. 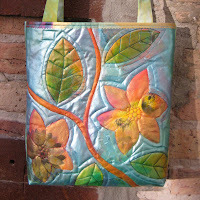 I will be teaching two classes in Atlanta the first weekend in August at Fiber on a Whim. 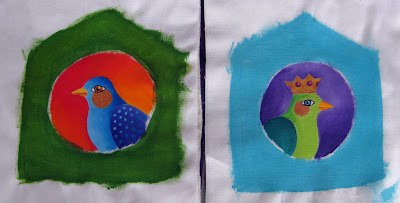 Mixed Media Fabric Painting and Tskineko Inks. 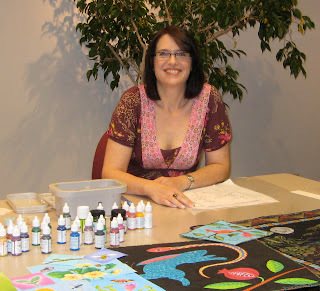 The Tsukineko Inks class has filled, but they are starting a waiting list and the Mixed Media painting class has two openings left, so if you are in the area and want to have a fun art day sign up now the classes are filling up fast. 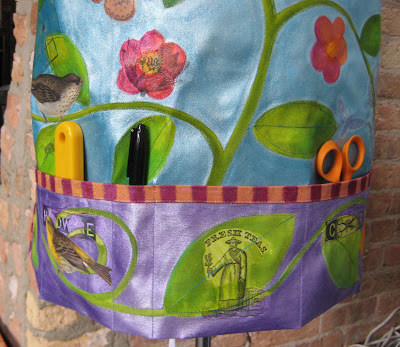 I had an idea a couple weeks ago to create a workshop for making a mixed media art apron to be worn when ever one is being creative and working with messy stuff. Because the whole surface of the apron is covered with paint it is extremely durable and can be wiped clean. I used a blank white chefs apron as a base and collaged, painted, then collaged again and stitched. I folded up the bottom edge to make handy pockets to hold tools and tea front and center. 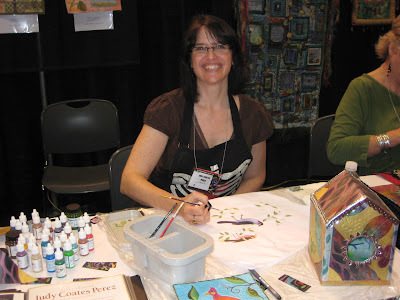 Until the International Quilt Festival- Chicago April 11-13. Once again I will be in the Cloth Paper Scissors Open Studios demonstrating what I do on Friday and Saturday. New this year, I will be teaching in Make it University. 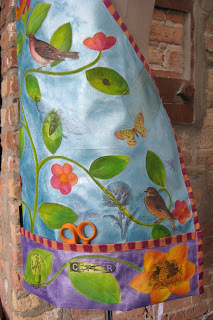 My class will be Mixed Media Painted Fabric at 12pm on Sunday. 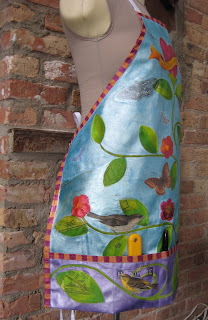 You will get to collage images and paint a piece of fabric that you can take home, quilt and turn into a project like this. PS. I'm off to a conference for a couple days, I will check back in on Sunday. The Ballad of Bilbo Baggins sung by Leonard Nimoy! My daughter Nina came across this on you tube. What a hoot! Dig those dance moves. Staedtler Master Carve rubber block. 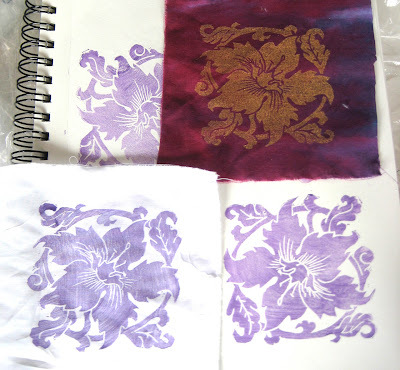 Purple fabric was stamped with gold textile paint. 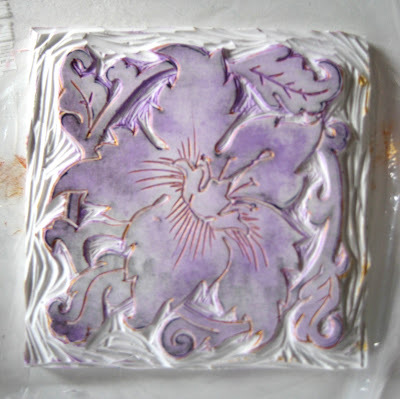 The white fabric and paper were stamped with Fabrico multipurpose craft ink.